Verdict: Because its made from high carbon steel it holds its razor sharp edge very well. Easy to re-sharpen in the field. Great versatility – camping, hunting, bushcraft. This knife with its 4 inch High Carbon Steel can take a fair beating. Its industrial strength makes this ideal for a bit of heavy duty action. Developed by Chris Claycombe, Spyderco and bushcraftUK.com it is a work of art in itself. A trusty companion for bushcraft use or the survivalists amongst us. The Spyderco Bushcraft G-10 is a great knife, comfortable in the hand and can take a fair bit of a beating in the field. Holds an incredibly razor sharp edge which can be sharpened and fine tuned on a whetstone because of the Scandi-grind setup. 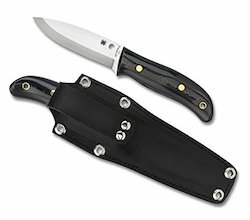 Come complete with a leather sheath that will offer protection for the blade form the elements. It will also offer you protection in case you take a tumble while carrying it out in the wild. Durable and quality design this is a must for any serious Bush crafter or Survivalist. This knife while top quality does have a few drawbacks. The blade, because of its makeup can rush if you don’t look after it properly. The sheath doesn’t handle the wet too well and can tend to smell a bit after a while – especially if it gets wet. It doesn’t have a hand guard so might be better suited to experienced hands or at the very least get some handling advice before you go chopping things down with it. Despite its flaws the Spyderco Bushcraft G-10 is worth the money and will travel everywhere with you once you decide to purchase it. Easy to keep sharp and can take a beating it will outlast many others in the same league.